For fans of Warriors and The Magic Thief comes a magical adventure story about a street cat who's mistaken for a wizard’s familiar. When Aldwyn, a young alley cat on the run, ducks into a mysterious pet shop, he doesn’t expect his life to change. But that’s exactly what happens when Jack, a young wizard in training, picks Aldwyn to be his magical familiar. Finally off the tough streets, Aldwyn thinks he’s got it made. He just has to convince the other familiars—the know-it-all blue jay Skylar and the friendly tree frog Gilbert—that he’s the telekinetic cat he claims to be. But when Jack and two other wizards in training are captured by the evil queen, Aldwyn will have to use all of his street smarts, a few good friends, and a nose for adventure to save the day! 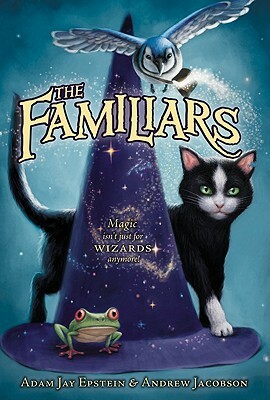 And don’t miss the exciting sequel to this Indie Next List pick, The Familiars: Secrets of the Crown. Adam Jay Epstein spent his childhood in Great Neck, New York, while Andrew Jacobson grew up in Milwaukee, Wisconsin, but the two met in Los Angeles. They have been writing together for film and television ever since. Their interest in space dates back to their early years, when Adam attended Space Academy in Huntsville, Alabama (and won the Right Stuff Award! ), and Andrew went to a movie theater (for the first time) to see a rerelease of Star Wars. Adam Jay Epstein lives in Los Angeles with his wife, Jane, and their daughters, Penny and Olive. Andrew Jacobson, his wife, Ashley, their son, Ryder, their daughter, Willa, and their two dogs live close by.